« ‘on colours and shades’ or ‘more sketches’? Social media reported widely on the events and images of hope for a changing of the rules of the game were re-enforced by a moving letter of support from Elias Khoury, the Lebanese author whose novel by same name inspired the activists. As the words count so much and the propaganda war is ferociously ongoing behind the scenes, it is not surprising that a ‘fair play’ campaign group operates out there whose aim is to ‘bring together those committed to opposing anti-Zionist activity and boycotts that target the people and supporters of Israel.’ The use of the term fair play is shrewd but only to a point – after all- who decides what is fair in play? the players themselves. And as the Israeli state uses more and more power against more and more people, its defenders need to claim ‘fairness’ as theirs and appropriate ‘play’ to belittle the issues at stake. However, Bab Al Shams and many more actions and campaigns that make their way into public consciousness as theatrical, non violent and worthy of attention are indeed slowly and surely changing the rules of the game, just as they set out to do and you can’t say fairer than that. 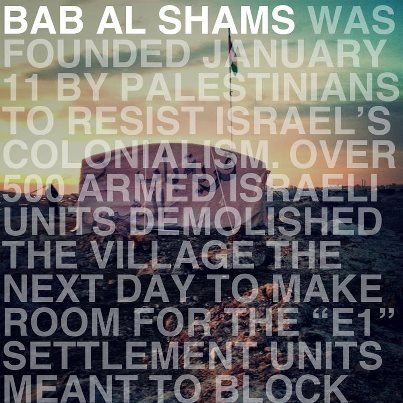 As Elias Khoury writes in his letter to the activists of Bab Al Shams ‘“I see in your eyes a homeland born again from the rubble of the Nakba that started 64 years ago, and continues to happen, I see the words, I see you growing in my consciousness, I see you flying high reaching out to the sky” – The activists have opened a gate to the sun in the midst of a harsh winter and they are not playing games, after all who wants to play with bullies?